Here, I cover 7 online AI to SVG converter free websites. Using these online converters, you can convert images into different file formats. The file converters support formats like EPS, EMF, WMF, PS, SK, etc. You just need to add the AI file and then select the output format as SVG. Thereafter, you can start the conversion. Also, you can download the converted file on your computer. Some of these websites let you add input file from your computer, Dropbox, Google Drive, or by URL whereas other sites just let you add input file from your PC. Apart from that, you can convert other media as well. For example, you can convert audios, archives, videos, documents, ebooks, presentations, etc., into different formats. All these online file converters can be used without even signing up. Let’s read about these online AI to SVG file converters one by one. Convertio is a free online AI to SVG converter. You can convert other media as well. For example, you can convert font, video, audio, presentation, text, archive, document, image, and ebook. The converter supports various formats. In order to add files in the converter, upload files from your PC, Google Drive, URL and Dropbox. The maximum file size is 100 MB. To convert AI file into SVG, upload an AI file as input file. Then select the output format (SVG) in the vector section. This online converter also supports EPS, EMF, WMF, PS, CGM, PLT, SK, SK1, and FIG. After that, you can click on Convert button. It takes a few seconds to convert your file. Thereafter, you can download the file. This is another online AI to SVG converter called CloudConvert. You can convert any media like archive, audio, cad, document, eBook, font, image, presentation, spreadsheet, vector, video and website. These media files can be converted into different file formats. After uploading the input file in this online file converter, you can choose your output format. This converter supports only SVG, EMF, and WMF to convert the AI file. Thereafter, you can click on Start Conversion button. Once your conversion is done, you can download the converted SVG file on your computer. ZAMZAR is another free AI to SVG file converter. This online service works as a file converter, URL converter, file manager, and API developer. 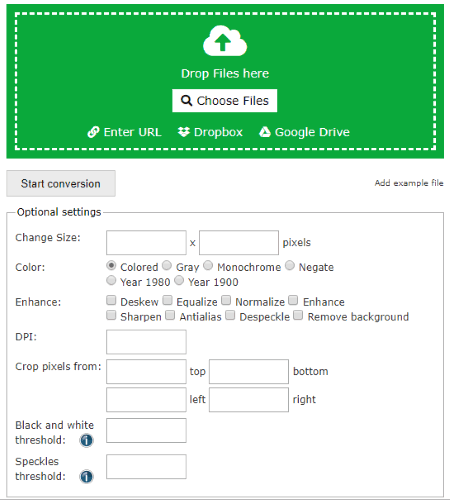 You can drag and drop the files or upload the image from your computer. Also, you can add the image URL. Then, you can choose the output format as SVG. Also, this online converter supports other formats like BMP, GIF, JPG, PCX, PNG, TGA, TIFF, WBMP, and WEBP. After choosing the output format, you can click on Convert in order to convert the file. Then, download the converted file. OnlineConvertFree is a free AI to SVG file converter. Using this online converter, you can convert documents, audio, images, book, and archives into different file formats. Once you visit the site, you can click on choose the file in order to add input file. Then, you can select an AI file from your computer. Once it is uploaded, you can choose SVG format as output format. This converter supports PNG and PDF file formats as well. After choosing the output format, you can click on the CONVERT button. After that, you can download the file. Another online file converter(ONLINE-CONVERT.COM) where you can convert images into different file formats. This converter supports formats like BMP, GIF, EPS, JPG, PNG, etc. Also, you can convert media like audios, ebook, document, archives, etc. This is one of the good SVG converters. Upload AI file from your desktop, by URL, Google Drive, or Dropbox. Once you upload the input file then you can choose the output format to convert it into SVG. Apart from that, this online file converter lets you do the optional setting for the image. When you are done customizing the image, then you can hit the Start convert button and download result as an SVG image. As the name suggests, this (Free Online Converter) is a free online AI to SVG converter. Also, you can convert image, vector image, audios, videos, document, eBook, archives, etc. Also, you can create GIF and optimize JPEG, PNG, etc. files. To convert AI file into SVG, you can click on Vector Image Converter. You can easily choose an AI file from your computer. Then, the next step is to select the output file format. After that, you can hit the Convert button. And then you can download the SVG file on your computer. Free File Conversion is a simple AI to SVG converter. With the help of this converter, you can convert archive, image, presentation, spreadsheet, and document. Also, you can convert images into different file formats. To convert the images, this online file converter lets you convert AI, GIF, ICO, JPG, PNG, PSD and SVG files in various formats. This online file converter lets you convert AI file into DXF, PNG, EMF, EPS, PDF, PS, WMF, and SVG. The process of adding AI file is quite simple. You can add input file from your computer and then click on SVG as output format. Thereafter, you can click on the convert button. After processing the conversion, you can download SVG file. Also read: JPG to SVG file converter free websites. These online file converters are quite easy to convert files online. These converters support various formats. You can give it a try and convert AI files into different file formats.